I'm going to go ahead and start with a disclaimer which I rarely do. I apologize in advance for how this is going to read. I had a slight SNAFU while processing these images that caused me to be dead in the water for nearly a full week. Without knowing what photos I had, I wasn't able to really write this blog entry, so I sat on the memory....and I sat....and I sat. As of two hours ago, I had the computer hooked back up and was up and running again. Here is the story, to the best of my memory. Picture it....a week ago. The weather was supposed to be cloudy with a few showers in the morning, and then moving into partly cloudy conditions later in the afternoon. We had been getting several days of rain, and the last of it was on Friday night. My plan was to head out to Hanging Rock in the morning to shoot Tory's Falls which looks really good after a lot of rain. I figured that the lighting would be pretty decent in the morning for some waterfall photography. For those of you that are observant, you will notice that the opening picture doesn't look much like a waterfall. In fact there is no water to be seen here. Yes, you are correct, this is not a waterfall. You see, what had happened was...As I was driving down the road I was looking up at the sky noticing that the clouds were breaking rather quickly. This was frustrating since I had been sitting at home for a couple of hours watching the clouds to see what they were going to do. It kept looking like they were going to break open, but never did. I had decided to count on them sticking around for a while. It took about 10 minutes of driving to clear the sky. Yes, my driving has magical powers when it comes to the weather. The sky was just too clear for me to do any kind of waterfall photography, so I decided to go with plan B, which was to head over to the shop of a Rat Rod Builder in East Bend. There were a lot of great subjects to work with on his property and I was about to text him to see if I could swing by and spend a portion of the day out there. 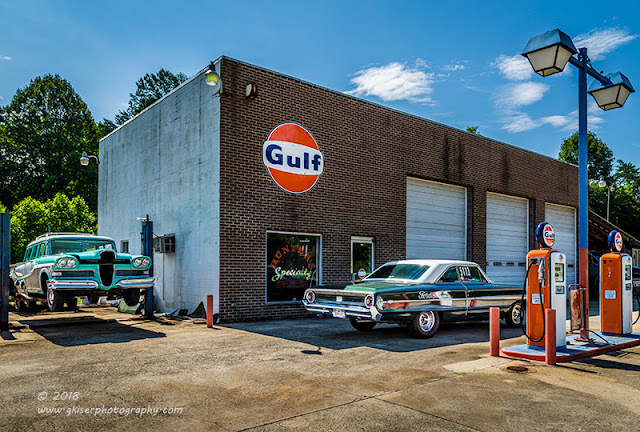 As I was examining the sky, I came across a little restoration shop that I have photographed at a time or two in the past. The lighting was not the best, but something caught my eye. 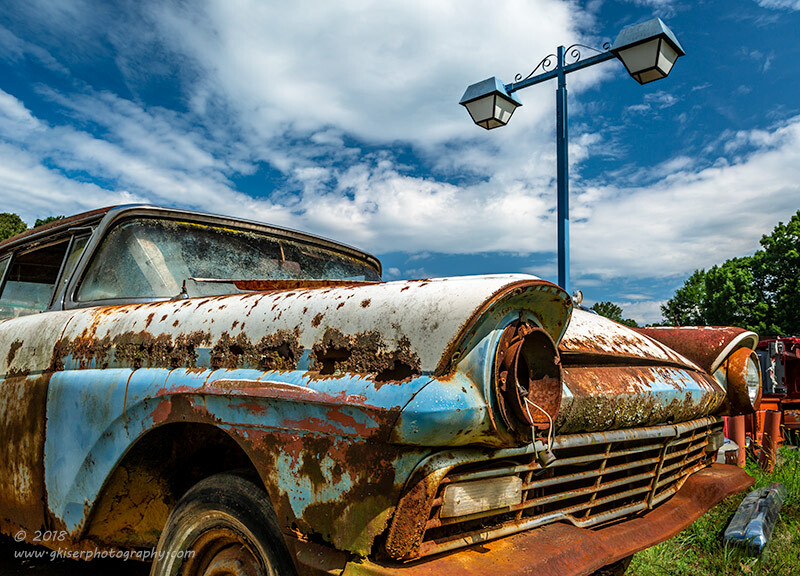 Was that an Edsel that I saw on the side of the lot? I did...I did....I did see a puddy tat...I mean an Edsel sitting there on the side lot. I got turned around and came back to the shop. 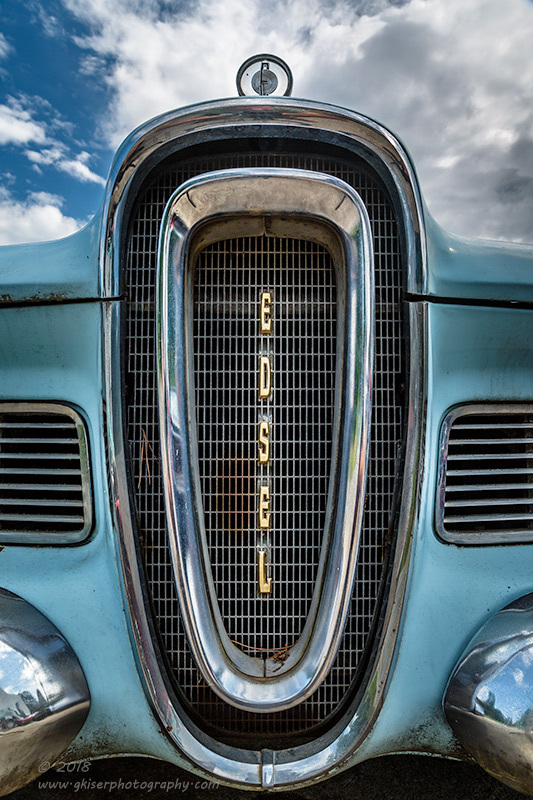 Not only had I seen one Edsel, but I had also seen another one, as well as a bevvy of other possibilities to shoot. East Bend was going to have to wait. I already had a shot in mind of the Edsel Grill, and I was pretty sure I could make it work. I pulled into the lot, over to the side so that I wasn't in the way of any potential shots. I pulled out the camera and put my 24-70mm lens on, as well as my Singh-Ray Color Combo Polarizer. I went over to the first Edsel and started to work out a composition. It took a little bit of doing as I was going for a symmetrical shot focusing on the center grill. There is just something fascinating about the design of the Edsel's front ends, and this was my best chance to capture what drew my eyes in. As I was tightening up the shot, there were some clouds that were working their way across the sky over the car. Since I was at the wide end of the focal length range, I was able to get a very dramatic shot of the vertical grill as well as a good bit of the sky above. 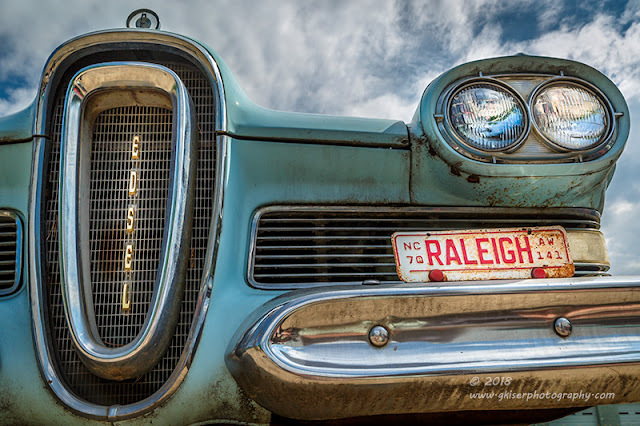 The Edsel logo was dominating the center of the frame, and the gold hues gave some much needed warmth to the composition. When I looked at the LCD I got a little excited, but I wasn't convinced that it would turn out. With the lighting that was going on , the clouds were pretty much washed out, and there were some pretty deep shadows in the grill. The saving grace was that the histogram was showing detail in both areas, so I had a lot of hope about how this would turn out. From my low position, I utilized some of the transforming functions of the Manfrotto tripod to get the camera inches from the ground. I laid across the parking lot to get the composition just right (opening image) before releasing the shutter. 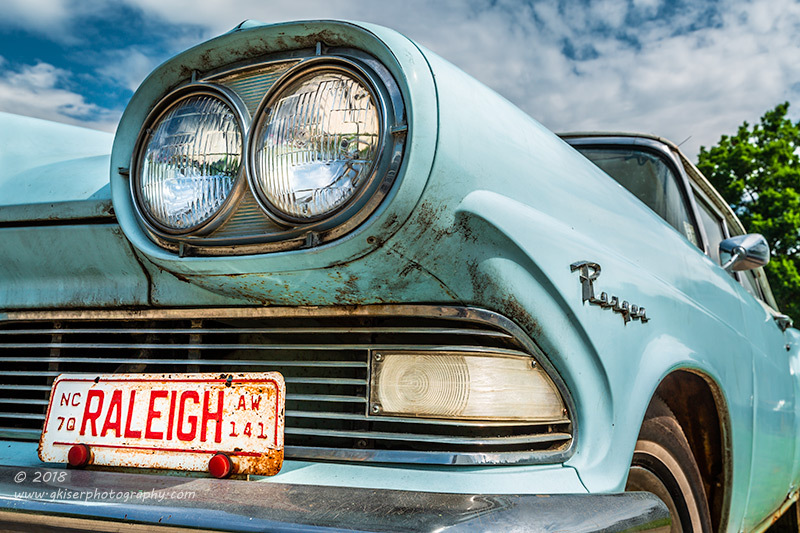 The down low angle, coupled with the Raleigh tag on the bumper really set this image off. The histogram was showing the same tonal range as the first composition that I talked about. While it didn't look that great in the LCD, I was feeling decent that I could bring out the detail when I got home. While I was down there, I might as well look at other possibilities for compositions. Plus, I'm getting old, and once I'm on the ground, it takes a while to get back up again. The headlight bucket has always fascinated me with these cars, and the way that the grill wraps around and includes a marker light is a great styling touch. That Raleigh tag provided a great triangular balance to the front corner of the car, and I found that when I got those elements lined up just like I wanted, I also had the added benefit of getting the "Ranger" emblem to show on the fender. The sky was still quite interesting, so I counted this image as a success as well. I was on a roll...until I tried to shoot the entire car. While it was an excellent subject, I just couldn't find a composition that I liked that fit the car. After shooting these isolations the entire car seemed to fall flat. I was thinking that I was about done here, but then I decided to look at some of the other cars since I have been having some pretty good luck shooting in the harsh sun lately. There was a very nice example of an Edsel Bermuda Wagon on a lift to the side of the building. It had some great wooden panels on the side, and lots of texture to get lost in. The paint was in pretty good shape, so it was not one that I would normally get all excited about. This one was special though, I just couldn't explain it. I got into a position, wedged between the Edsel and a Mustang II (really, what were they thinking with that car?). 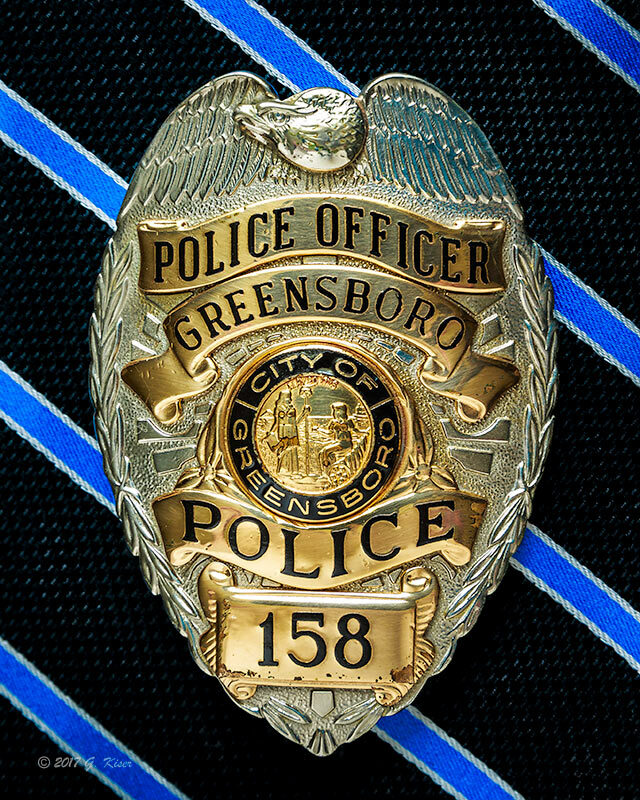 I found a great little emblem tucked into the wood siding on the front fender and started to work out a composition using that crest. 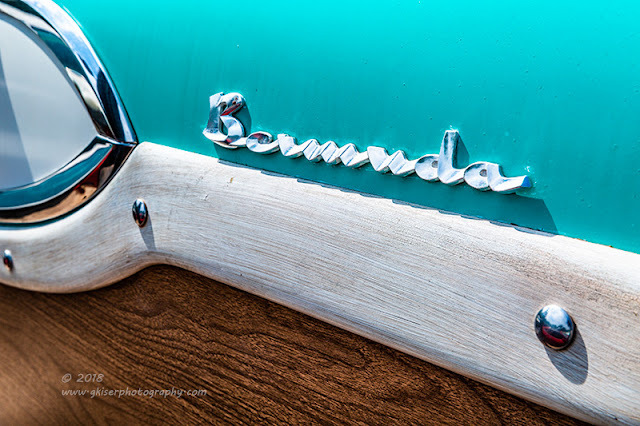 I found that these were turning out better than I had thought that they would, and I started to look for other abstract isolations on the side of this Edsel. I was back in the groove once again. Something that I have said all along about cars from the 40's and 50's is that they are rolling examples of art. There was a lot of thought given to the materials used, and the designs on the car. This Bermuda was an example of that artistic influence, and I wanted to capture as much of it as I could. 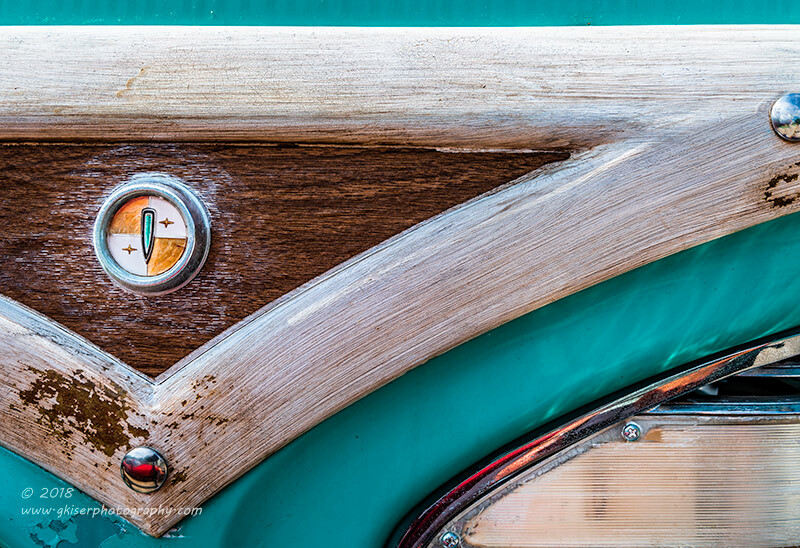 This section of the passenger door had a marine feel to it with the pale wood and chrome rivets. The chrome scallop breaking up the mint and creme colors was just fantastic. I even captured a bit of the Mustang II for a splash of warm color to compliment the darker wood paneling on the bottom edge of the frame. The door handle gets lost in this composition and the eyes just sit and enjoy the lines and curves of the decorative siding on this land yacht. I would be totally amiss if I were not to include an emblem shot with this car. Just ahead of the scallop that I was so interested in was the subtle script that described the car. The brown, tan, and mint colors all worked together so well, and the diagonal composition (dictated by the close quarters) gave a lot of visual tension to the image. I was having the time of my life with this car...or at least the side of it. The front was missing a lot of important pieces (refer to Step Into History) a bit earlier in the article. Why spend all of my time on a single area of the car when I was pretty sure that the rear held some of its own surprises for me? The rear of the car didn't disappoint, not in the least. 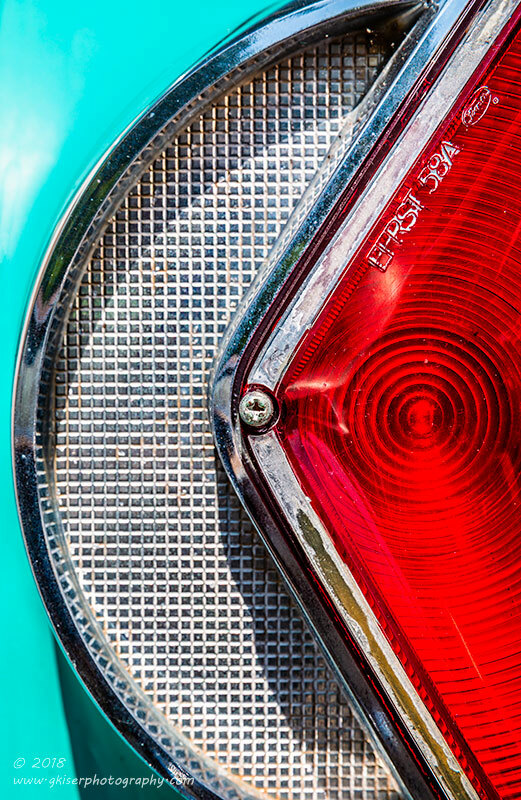 The tail lights were really cool with the arrow shapes and complimenting circles and arches. This was the stuff that photographers really can have some fun with. Hey, wait a minute....I'm a photographer, and I have a camera!!! I started to set up some isolations on the lights. There were so may angles to play with, and I got to include the color pallet that had drawn me into the isolations on the side of the car earlier. The lines that I saw coming together were really great, and got me rather amped up once again about this car. Wanting to try lots of different things with these lights, I got in even closer and just took a portion of the light assembly. This is where the 24-70mm lens really shines. I can shoot wide angle shots of an entire car, and I can get in to almost macro territory when shooting the details. With this one, I was able to isolate the basic colors and textures of the light. 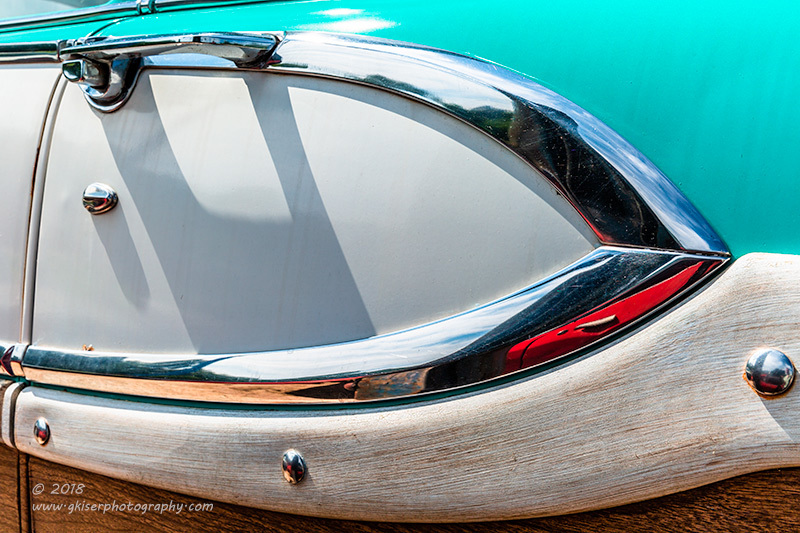 The square, rings, diagonals, and arches all worked together for a modern art rendering of this 70 year old car. OK, I was really having too much fun now. I was really looking forward to seeing what I had captured when I got home. I was really hopeful for about 3-4 images at this point. I'll save you the trouble of counting back through this entry. I have nine images thus far, to be fare, eight of them had been shot at this point. Yes, I hear you proving your superior math skills by telling me that is twice the number that I was hoping for at this point. What can I say, I was on a roll with these two cars. I was in the zone, so why should I quit while I'm ahead? I shouldn't, you are completely correct. I gathered up my equipment and started to look at the other cars....well, except the Mustang II. Well, as luck would have it, there was an early Ford Fairlane sitting behind the Edsel. Man was it in bad shape. Rust had eaten through the fender, the headlight was missing...hey wait a minute. That is my normal recipe for automotive photography. Yeah, this was going to be fun too. It was in close proximity to the other cars on the lot, so that meant I was going to have to be creative with the compositions. I started with isolations, and really liked the study of the front fender where the chrome molding used to be at the paint division line. The mounting holes had all rusted through, creating a great texture. 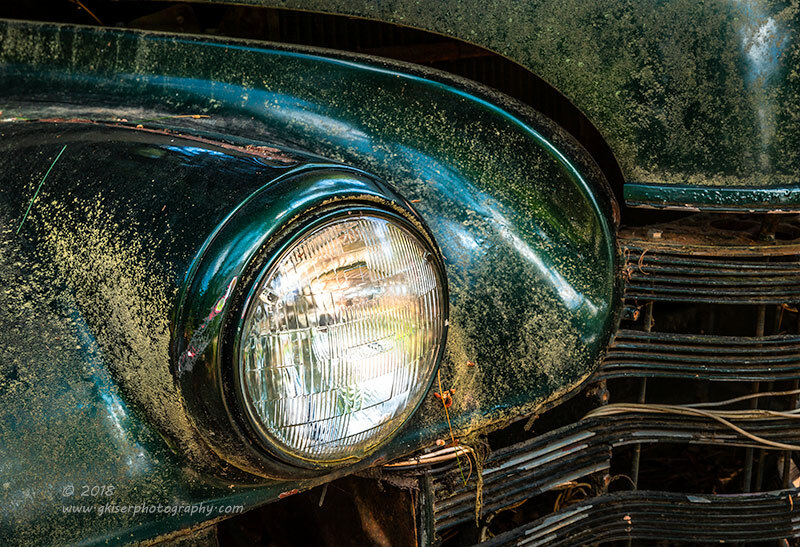 The patina on this old car was fantastic too. This was more my speed than the Edsels, which were in pretty good shape...But boy did those Edsels photograph well! I'm going to take a quick break from my story about the capturing process and fast forward just a bit. When I got home, I had a total of 77 images to review which I started on pretty much the minute I arrived home. Things were going well...in fact, I was getting more and more excited about what I had captured as I was culling the less than ideal images from the collection. I started to work on processing them, and made it through to this point and as I was working on this particular image, Lightroom froze up. This happens occasionally, but not like this. Usually, within in a few seconds, my cursor will reappear and I'll be back in business. Not this time. The cursor was gone, and even trying to bring the task manager up wasn't working at all. I had to do a hard shutdown on the computer which I hate doing. I waited about 30 seconds and started it back up again. Well, it locked up while booting this time. Hmmmm, that isn't good. Long story short, Over the next two hours I was able to boot up about three times, but every time it would lock up fatally, and I was able to get less into the computer with each boot session. Eventually, I was unable to get the screen to turn on, and the computer would freeze giving me an error code on the power button. I started to google what was going on with my phone. My fixes involved changing out the button batter, reseating the RAM, and even swapping the memory to the alternate ports. I completely drained the power source several times, but to no avail. It was totally bricked. 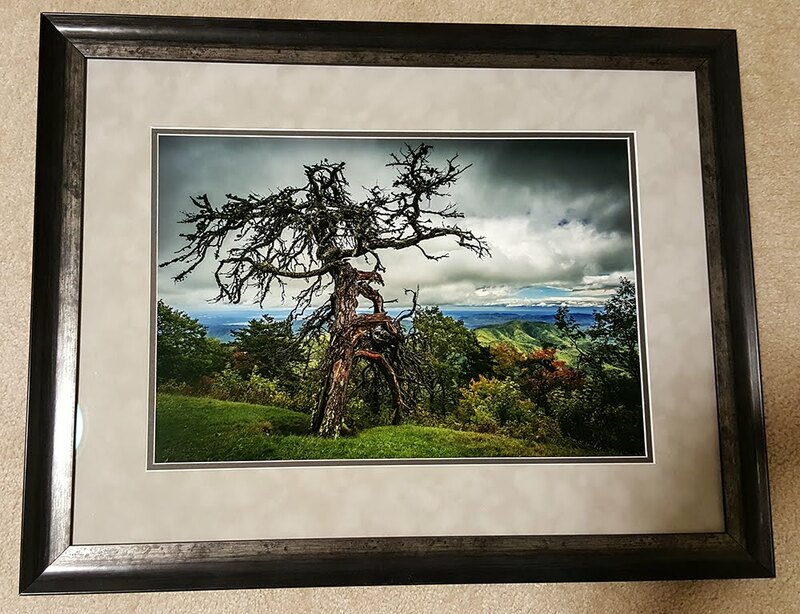 I had not saved the images as I was not totally finished with the editing process, so I had nothing to show for the 2.5-3 hours I had been working on images. I was in a panic, and knew that my editing was done for the day. Fortunately, I was able to get the CPU to the shop and they were able to work some magic and get it to boot, and they were able to fix the problems. fortunately, there were no hardware issues, and I was able to keep all of my progress on the new pictures. When I picked the CPU up and got it home, I was able to pick up where I left off. I was so thankful! So let's get back to the morning with the images that I have just now finished processing. I know what you are thinking. That idiot doesn't realize that the problem with the computer sucked the color right out of his pictures. No, I made this one monochrome on purpose. When I shot it, I liked the scene, but wasn't wild about the car. It was white with black stripes. The bit of rust on the quarter was the only splash of color on the car. The grass and trees were lit by a relatively bright sun and had an odd color cast to them which I wasn't really liking. I tried to play with the color image and got it pretty close to what I was seeing at the time, but still wasn't happy with it. As a last ditch effort, I made a conversion to monochrome and instantly became more happy with the image. As I worked with the tonal relationships I liked it more and more. 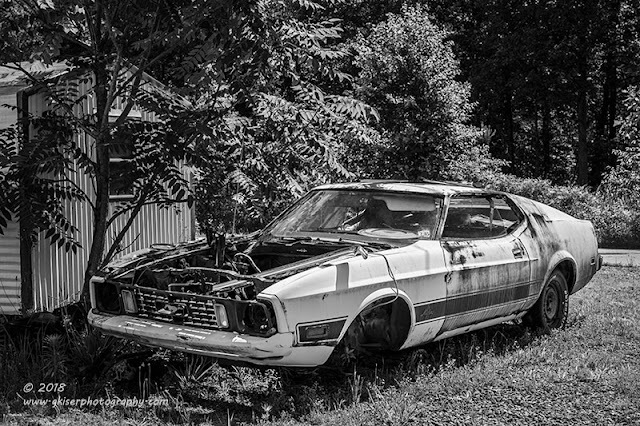 Ultimately, I trashed the color image and kept the monochrome as it gave a timeless feel to this old Mustang. As I was working my way back to the main parking area, I came across a few old pickup truck beds that were stored. There was one that caught my eye with the patina that it showed. 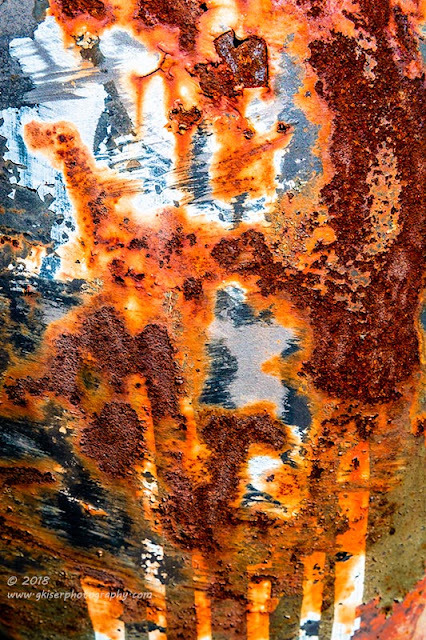 The rust was fantastic, but I was having a hard time finding something to anchor the rust. What I ended up with was one of the flared sides that had some interesting white paint that was done as stripes and a design. I wasn't quite sure what I was looking at, but my mind immediately went to the logo of "The Punisher." With that, I had found my anchor, and I started to compose an image that captured that imagery. 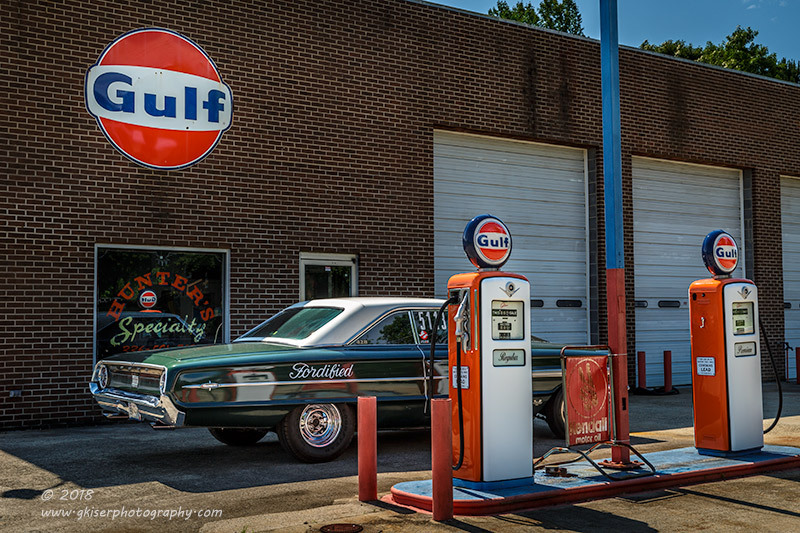 The last car I wanted to capture was a Fairlane race car that was sitting out front by the gas pumps. The car was actually in pretty good condition and didn't have the usual patina that I liked. It was also a dark color which wasn't going to photograph well on its own. The decision was made to include the area that it was in and make the car a supporting element to a greater scene. The Gulf Pumps have always fascinated me, and I found that I was able to include them with the large Gulf logo on the building, with a bonus logo reflected in the window of the shop. I actually shot a couple of different compositions with this though in mind. The other one that I liked appears earlier in this piece. Both say something different and I think that they both stand on their own very well. The car has a lot of character being included in the whole scene and I think it makes for a much better picture than trying to isolate the car, or bits of it. With the sun getting a little too harsh, I decided to pack it in and head off to home, or possibly another location if I happened to see something that might work. I had given up on the Rat Rod shop since the lighting was not all wrong for that setting. I was just about to give up, and was actually about five miles from the house when I passed by a car that Toni, Sierra, and I had seen recently tucked in the trees by a house. With the dense trees, I thought that the lighting might actually work out. What was it going to hurt to stop and ask if I could shoot a couple of pictures? I pulled into the driveway and immediately heard music. It sounded like I might actually luck out and find somebody outside which is when I have the best luck in asking for time to shoot some pictures. Sure enough, the owner was outside working on a car. He was very nice, and was happy to let me photograph his car. He even told me the story behind it. The story is titled "It is not for sale, I don't care how much money you have!" It is actually a feel good story though. The car was his Dad's, and it turned into the current owner's first car in high school. It was a 1940 Oldsmobile which is apparently quite rare. 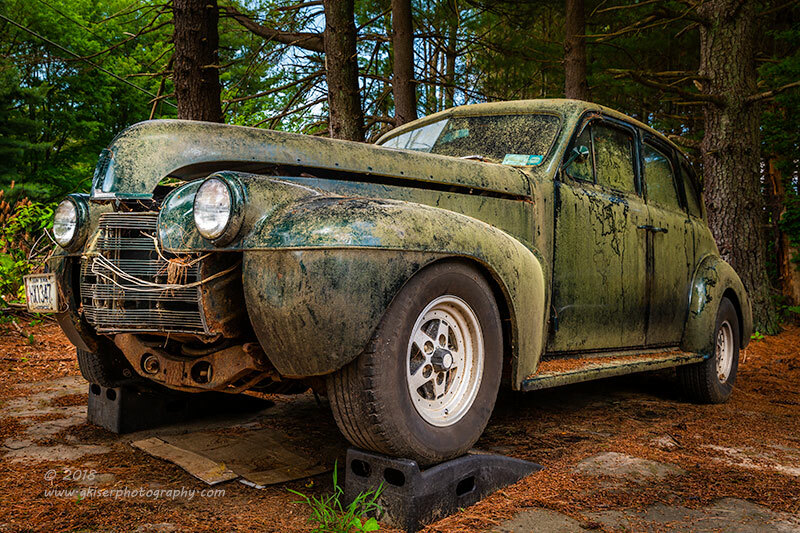 His father recently passed away and the current owner has full intention on completing a ground up restoration on the car starting sometime this summer. After hearing how much money he passed up on this car recently, I can say with relative conviction that he means what he says. I do wish him luck with the project as the car is in really good shape despite the rough look . 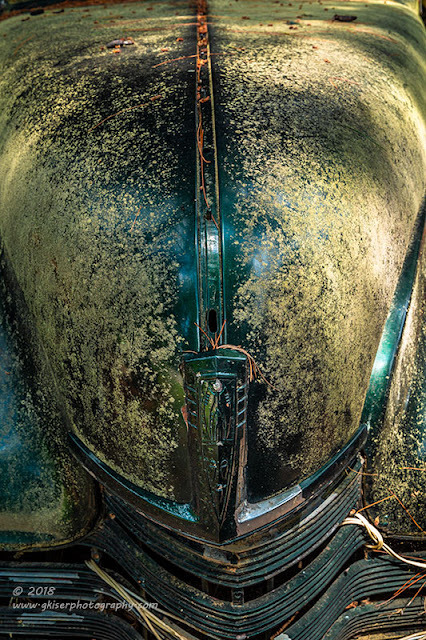 While the story and the car were quite fascinating for me, I really liked the textures of the moss on the paint. 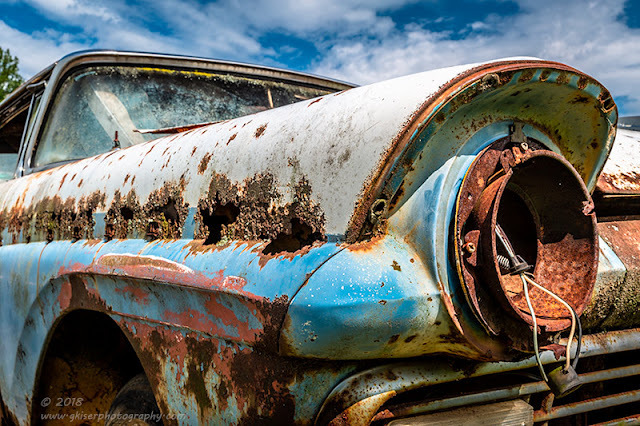 It was almost a decent substitute for the patina that I like on these old cars. Like I said though, the condition of the paint was actually pretty good..under all of the moss. I was able to get a few isolations which brought out the character of the car. This one of the hood, might be less character of the car, and more character from the movie Alien. Looking at the color, shape, and texture here, I am reminded so vividly of the alien that was encountered by Sigourney Weaver back in 1979. Now that I have jogged your memory, I doubt that I am alone in that connection...right? 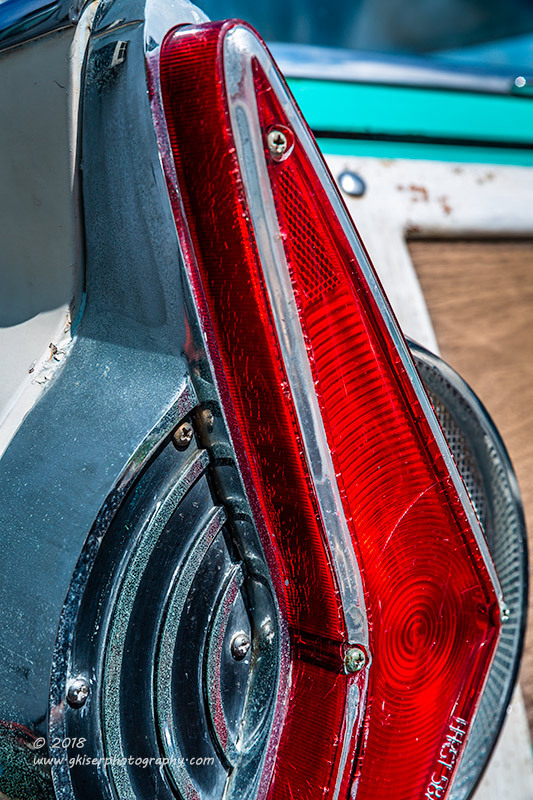 The curves around the light bucket were very interesting to me, and I worked several compositions that included the light and the fender curves with the grill as a boundary. I was wishing that the paint was in worse condition, but the moss once again helped me by giving some texture to the surface that you can see is still rather shiny underneath. Who knows, a new bumper and a coat of wax might be all this car needs. I spent another half hour or so at this house as he had a 1970 GTO in the side yard that I really wanted to shoot, but just couldn't find a successful composition that kept it clear of the clutter in the background. It was a great car, and one that I wish I had a satisfactory picture of. It was just in the wrong spot to really work for me. I wrapped up and headed home from here. I was so excited to see what I had from the day, and then all of a sudden, somebody pressed pause on my entire adventure. I'm finally at peace now, knowing that I have a total of 17 images that made the cut out of 77 frames shot. That is better than 20% which is rather cool, and I am happy.